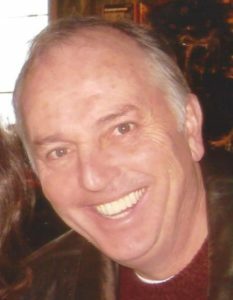 Hudson – Daniel Joseph Murphy Jr. 65, of Hudson, passed away peacefully in his home, surrounded by his family, Nov. 29, 2018. He leaves behind his beloved wife of 41 years, Cynthia J. (Bickford) Murphy. Daniel, the son of the late Daniel and Jeanette (Senecal) Murphy, was born in Marlborough and raised in Hudson. Daniel graduated and remained a proud alumnus from Hudson Catholic High School. He received an Associate’s Degree from Quinsigamond Community College. Daniel worked for the Hudson Light & Power for 37 years, achieving numerous certifications until his retirement, where he remained active as an elected member of the Hudson Municipal Light Board. Danny’s days were devoted to his family and enjoying life on the farm where he lived since he was born. He was an active member of the Assabet Valley Van Club and won several trophies for his prized ’65 Chevy van. He loved traveling with his family to archery tournaments and other sporting events, camping, bowling, and vacationing on the coast of Maine. Danny was a huge Boston sports fan, and especially enjoyed watching the Red Sox and Patriots. He also enjoyed strawberry sundaes from Eriksons Ice Cream. In addition to his wife, Cindy, he is also survived by his children, Jonathan Murphy and wife Mercedes of Hudson, Shawn Murphy and wife Cristi of Bolton, and Caitlin (Murphy) Candelmo and husband Frankie of Savannah, Ga. He always said that the sparkle of his life were his three grandchildren, Edith-Anne, Ivette, and Bennett. He is also survived by his brothers, Dennis Murphy and wife Karen and Jay Murphy and wife Christine, all of Hudson; his father-in-law, George Kenny of Clinton; his brothers-in-law, Timothy and Corey Bickford of Vermont, Robert Kenney and wife Jane of Clinton, Dan Kenney and wife Denise of Maine, and George Kenney of Littleton; and his sisters-in-law, Cheryl Bickford of Wisconsin and Colleen Rabaut and husband Chris of Michigan. He also has many nieces and nephews, as well as many Senecal cousins. Hudson was always a special place for Danny. From the community of friends he made through Hudson Catholic High School, to all of his colleagues at the Hudson Light & Power, there was never a day that passed that someone didn’t drive by and honk their horn when they saw him sitting outside on his patio. A Mass of Christian burial was celebrated Dec. 3 at Saint Joseph The Good Provider Church in Berlin, with burial at St. Michael’s Cemetery in Hudson. In lieu of flowers, to honor Dan’s memory, his family requests that you show acts of kindness for those in your community by donating to the local food pantry, helping out a family in need during this Christmas season, or simply being there to brighten someone’s day. We will all miss your smile, Dan.